Everything Just So: Christmas in New York 2015: Tiffany & Co.
Christmas in New York 2015: Tiffany & Co.
A magical scene at the Tiffany & Co. Fifth Avenue Flagship store, November 2015. I got a chance to make a quick trip into the city last week to see the holiday windows for 2015 and of course they were glorious! 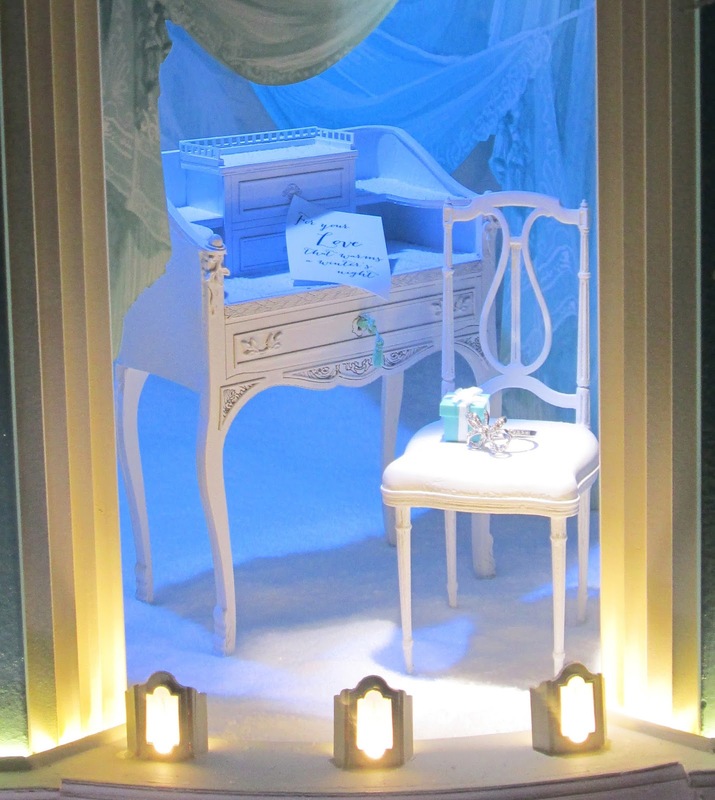 I started my visit at Tiffany & Co., and while last year’s windows had a modern theme, as well as a nod to the 1950s and 60s, this year the displays feel like they are all about old world glamour. So in love with this color scheme! The jewelry was as gorgeous as you’d expect it to be, with pieces from Tiffany’s high jewelry lines to more modest sterling silver pieces from the Atlas collection and gold bangles from the T Tiffany line, but the backdrops were definitely about the aesthetic from a bygone era. 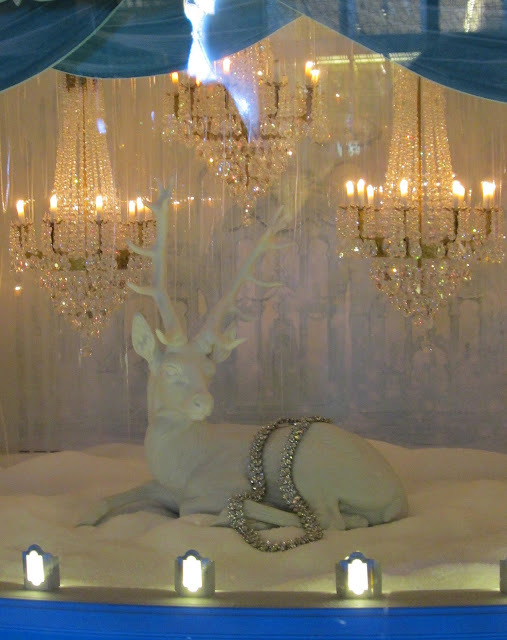 I loved the tiny chandeliers (so gorgeous), the porcelain figurines, the amazing details in each and every mise-en-scène, and the way the lights would change from pale blue to pink to white and then go dim before starting all over again. This post is heavy on pictures but I hope you are as enchanted by the beauty as I was. Enjoy! The porcelain figurines had a classical feel and many were cherubs wearing masks. ...to pink, right before your eyes. Gorgeous! I am crazy for the tiny chandeliers and the porcelain reindeer, with diamonds on top! A stunning Schlumberger “Bird on a Rock” clip. Love love love. More Schlumberger brooches atop a reindeer sleigh! A closer shot of the clips. I especially love the “Five Leaves” clip at the bottom, of yellow gold and diamonds. Glad to see the yellow diamond sparkler lights are still on the building, like last year. I loved details like this one! Great bangles and rings from the Tiffany T collection. 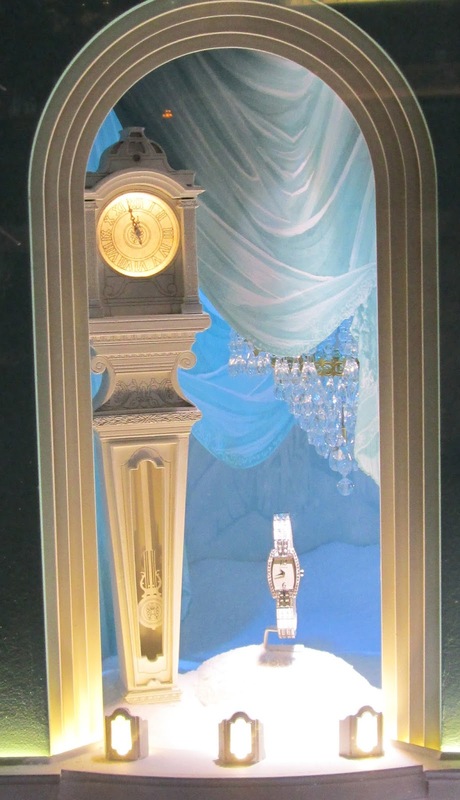 A lovely window featuring a watch and a necklace from the Atlas collection. 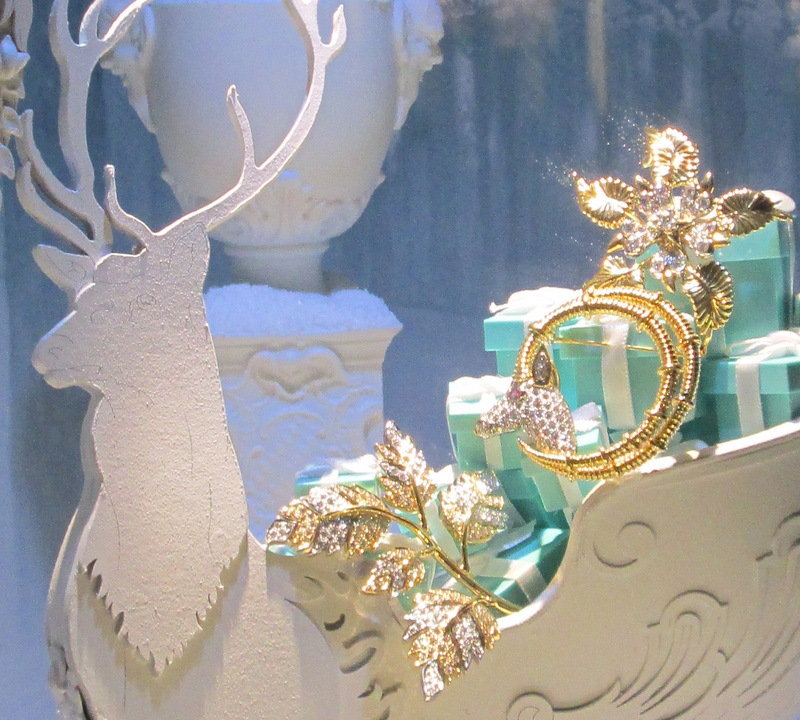 A window featuring pieces from the new Tiffany Bow collection. A very compelling window scene. This one was my particular favorite. I adore the color scheme and the amazing details in each of the windows. There is a little video on the Tiffany website that goes along with the windows, just like last year, and it is very charming and will have you dreaming of the holidays and winter in New York City! If you saw the windows let me know what you thought of them and if you haven’t but get a chance to, try to go at night, when the crowds are far less and you can have each window all to yourself! Also, Tiffany, unlike Bulgari or Van Cleef & Arpels, each across the street, keeps its jewelry in the windows all night long, they don’t take the pieces out just because the store is closed. I find this so wonderful of them and it definitely gives a gal the feeling, any time of day or night, of gazing into the windows and being able to dream of jewelry just like Holly Golightly did in the opening scenes of Breakfast at Tiffany’s! 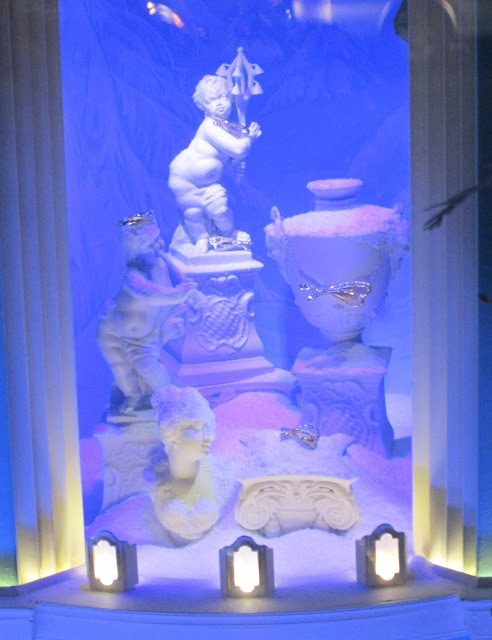 I've looked into Vienna's and Hamburg's Tiffanys in the last couple of days - the window decorations don't even come close to what NY is showing. Such a pretty post! I wont be shopping today, but I loved window shopping with you! I hope your Thanksgiving was wonderful. I look forward to you sharing windows every year, Jill! Thanks so much! It is lovely. I'm glad you enjoyed our work. One of these days, I need to be in NYC during the holidays to see all the amazing window displays and do all the tourist things for the holidays.